This final sketch from my new series is another from Mana Pools. This was an elephant bull who definitely had right of way through our campsite, looking for delicious seed pods around our tents. Behind him you can see the Zambezi River and Zambian escarpment – a typical view of this beautiful park in northern Zimbabwe. I thought this would be a great sketch to end with – showing a little of the landscape, along with an orange and green elephant! All my field sketches, are created in Africa directly from life, or sketched back at camp purely from my memory of sightings. They are completely finished in Africa and I use no photos or video reference at any time in their creation. It is always tempting to add finishing touches back in the studio, but I avoid this to ensure that my field sketches really are field sketches. This Original Field Sketch is sold, but Limited Edition Giclées are available, priced at US$120 each. Only 10 copies are available, printed using archival inks on watercolor paper, 14×11″, all signed and numbered by me. A donation will be made to African conservation from every sale. My latest visit to southern Africa was one of my most productive sketching trips so far, and over the next few months these sketches will inspire a new body of studio paintings. Thank you for taking this trip with me through the amazing wildlife areas of South Africa, Botswana and Zimbabwe! 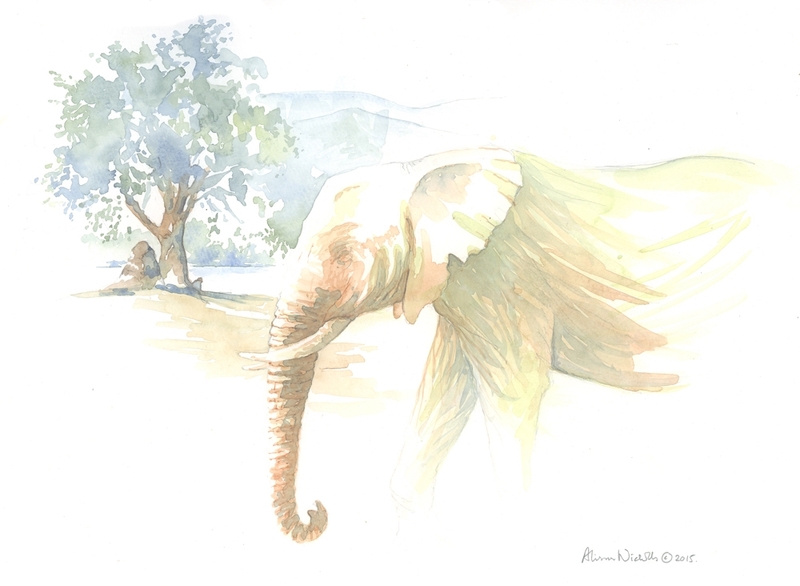 This entry was posted in African Wildlife, Blog Posts, Elephants, Field Sketches, For Artists, Watercolors and tagged alison nicholls art, elephant art, elephant bull sketch, elephant watercolor sketch on November 22, 2015 by Alison.